Dr. Breandán Kennedy is a Fighting Blindness funded researcher and head of the 3D-NET Industry – Academia consortium. 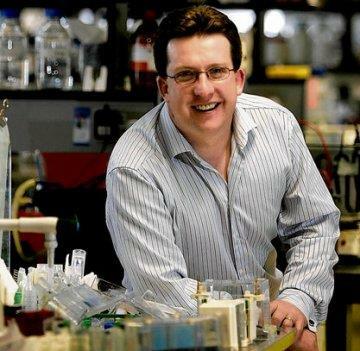 He is also a senior lecturer and Head of Pharmacology in University College Dublin. He is a Research Fellow of the Conway Institute at UCD. The main objective of Breandán’s reserch group is to develop gener and pharmacological for human blindness. Using zebrafish as an in vivo system, they have identified several families with inherited blindness and have used these to characterise disease progression and evaluate therapies. They have also developed in vivo assays enabling us to discover novel drugs with specific neuroprotectant, anti-angiogenic or toxic propertiers in the eye. Technology platforms include: zebrafish: development, expression profiling, genetics,transgenics, morphants and drug screens; Retina: Morphology and Function. Dr. Kennedy’s group focuses on three primary areas of research. (1)Molecular Genetics of Vision and Blindness. The objective here is to better understand the factors that regulate normal development and function of vision, as well as, genetic mutations linked to blindness. The group’s approaches include generation of zebrafish models of inherited blindness or transcriptome and proteomic profiling of eye development and cone photoreceptors. (2)Ocular Drug Discovery. Breandán’s research group seeks to discover and develop drugs that modulate pathologies associated with blindness (e.g. angiogenesis, vessel permeability, inflammation & neurodegeneration). They apply random or targeted drug screening methods in zebrafish (GFP reporter lines or behavioural assays) and progress hits to assays in human cell lines, explant tissue and pre-clinical rodent models. (3)Ocular Drug Delivery. To enable sustained drug release in the posterior eye they are developing drugs encapsulated into microparticles. In collaboration with RCSI and NUIG, they have manufactured PLGA and HA drug loaded microparticles and are testing the pharmacokinetics of drug release and the safety and efficacy of the microparticles.